How good your digital music sounds often comes down to which file format it's encoded in. Be that as it may, every Mac audio setup is only as strong as it's weakest link, and if your Bluetooth connection isn't up to scratch, even the best BT headphones will fail to deliver a decent wireless listening experience. By design, all Bluetooth devices support the low-power SBC audio compression codec as standard. Fortunately, modern Macs also support AAC (Apple's preferred iTunes codec) and aptX, which Android devices often use. These two codecs offer higher quality audio and generally lower latency than SBC, which is why most third-party wireless headphones on the market support one or the other, and sometimes both. Yet for whatever reason, despite their AAC/aptX support, some headphones fall back to the bog-standard SBC codec when connected to a Mac. This can lead to a particularly underwhelming audio experience, not to mention latency-related sync issues, which will be a distinct concern if you use your headphones while gaming or watching movies. But first, it's worth checking which codecs your brand of headphones actually supports: Look for codec logos on the box, and make sure to check for references to codecs in the manual and any accompanying/online spec sheets. 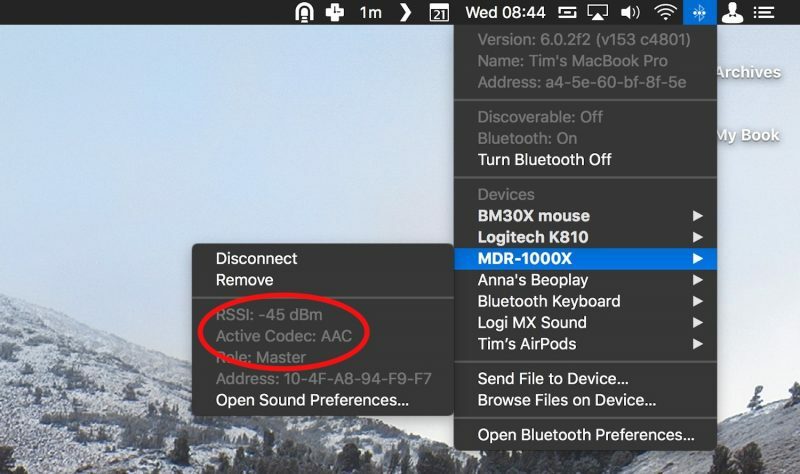 Once you've established that your headphones support aptX and/or AAC, you'll want to identify which codec is being activated when you connect the headphones to your Mac. Follow these steps to find out. 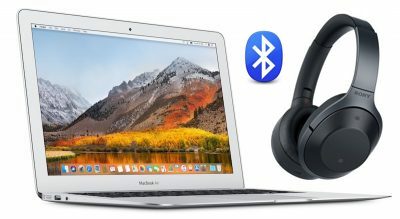 Establish a Bluetooth connection between your Mac and headphones in the normal manner. Play some audio on your Mac so that it's streaming to the headphones. Hover your mouse cursor over the headphones in the connection list. You should see the headphones' Active Codec shown in grey. 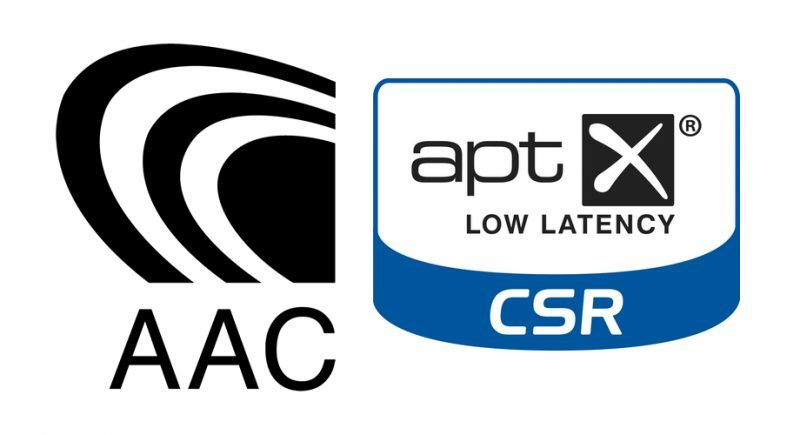 If your headphones are using AAC or aptX, you don't need to do anything. Without going into the technical details, both standards provide relatively stable wireless connections and – as far as Bluetooth goes – comparably decent sound quality. However, if the codec shown is SBC, you'll probably want to change it. Here's how. Open a web browser, navigate to Apple's developer downloads page, and download Additional Tools for Xcode 9 [Direct Link] which contains Apple's Bluetooth Explorer utility. Note that to access the page you'll need to register for a free Apple developer account if you don't already have one. Alternatively, use Google to find the Bluetooth Explorer utility hosted elsewhere and skip to step 5, but if you're not downloading from Apple, be sure to screen the file for malware. Once downloaded, double-click the Additional Tools dmg file to mount it on your desktop. Open the Additional Tools drive and navigate to the Hardware folder. Open your Mac's Applications folder in another Finder window or tab. 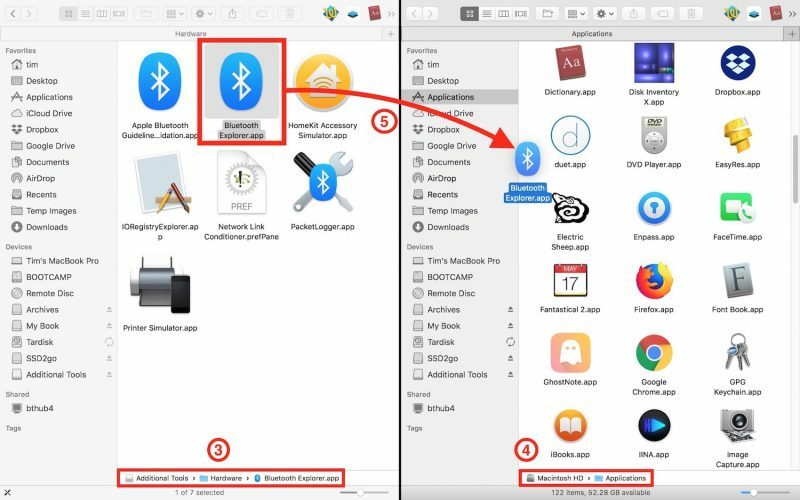 Drag Bluetooth Explorer into your Mac's Applications folder and launch the app from there. From the Bluetooth Explorer menu bar, select Tools -> Audio Options. In the Codecs section, tick the checkboxes alongside Enable AAC and/or Force use of aptX (depending on your issue). 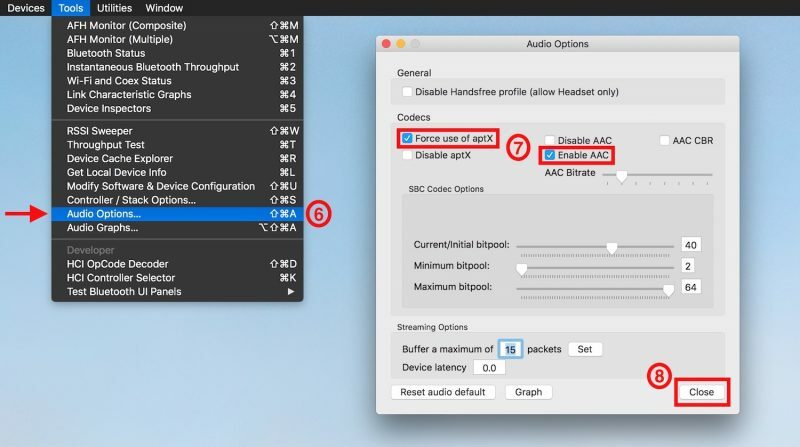 Make sure Disable AAC and Disable aptX are left unchecked. Restart your Mac, or reset the Bluetooth module. When your Mac reboots, you can confirm that the codec change has been applied by following the first series of steps in this article. To disable either codec via Terminal, simply replace -bool true with -bool false at the end of the command. What I always wanted to know is: when listening to iTunes music already encoded in AAC, will it pass-through or re-encode in AAC? Because you potentially loose the benefits of good compression if you recompress. This came to my mind when finding out about albums that sound bad because they are recompressed themselves. iPhones don’t support APTX which blows. Great article. This is what macrumors is all about. Interesting! I suspect Apple’s own audio devices, such as AirPods, and all of their newer OSs, support AAC? Do the Powerbeats support aptX though? Apple seems to prefer AAC. I’m not sure what the technical differences are but as the author says it’s likely not much and impossible to discern. To confuse matters, there are also multiple versions of aptX including aptX “high quality” which is supposed to be near or practically lossless. No. AAC, APT-x, just another delivery method. All are lossy. I found, garbage headphones, regardless of APT-x, AAC, SBC, sound is bad. Decent headphones, using APT-x, SBC, AAC, you can't tell to be honest. I use these the most. Supports APT-x on the Mac without any software changes, sounds great and cheap! I use both so I know they work with Mac OS X (High Sierra) and using a Macbook Pro 2009 model. I can't tell if this is sarcasm or not. It seems fairly simple and straightforward. I doubt this is something an average or casual user would care about anyway. Great article! Good job MacRumors! What about iOS? Is there any way to force AAC (or a2dp) on iOS devices? My Sony MDR1000X headphones sometimes default to the lower quality sound and the only way to get back rocking is to reboot the iPad!